Now, in my personal artist residency out here in San Francisco, I’ve hit the 1/2way mark to this project at 50, and I am incredibly satisfied with the TENxTENxTEN project and how it has turned out. Here is a picture (above) showing all the fifty I’ve done. It all begins with a mouse so they say over at Disney, and this site,.. well I suppose it all begins with a mouseclick. I’m sitting here in my Los Feliz district apartment in Los Angeles. I know a few facts about my surroundings as I write this. Its welcomely warm in my soft lighted apartment. I couldn’t be more comfortable than I am now. I couldn’t be more uncomfortable in structuring what to say next. With that being said, now that I’ve relatively explained my space to you, I should now probably introduce myself secondly. Hello, I’m Tennessee Loveless. I’m currently 34 years old. 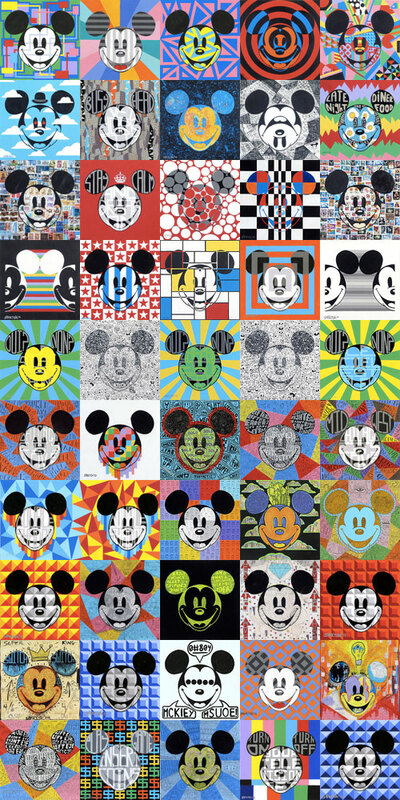 I’m a Los Angeles based artist currently represented by Disney Fine Art, Collectors Editions, and Linda Jones Enterprises. I’m a licensed artist for Disney and Warner Brothers in the realms of Pop/Op, and how I became discovered and represented was in essence a happy accident. Lastly. I should mention while I will keep most of these details vague in this introduction and let it rather be exposed in posts to come, the one thing I will tell you is that I am severely colorblind, and how I came to be an artist was a path filled with restrictions, rejections, refusal of defeat, drag queens, nomad living in a lot of different cities, a 2 ton weight of ambition, and never giving up. I’ve been working with Disney Fine Art since late 2010, and relatively I’m still in my launch phase with them. I started out with a geometric laced series involving standard characters, moved into the comic realm for a while with Snow White, Cinderella, and Sleeping Beauty tales, and of course…. my favorite… The Villains. .. But this blog is about none of that really, … because lately I’ve hit, what I think is the tip of the iceberg for something incredible… for so far its really come together in this fantastic sense, that it not only really hones in on that love for this classic character, but it also goes into this interpersonal relationship with a template and the environment that surrounds it. And boy what a rabbit hole I went down.. This site is about that experience. I have around 20 mickeys underneath my belt, to which, little by little I will show you. They will have stories attached to them about the experience of where I was, what I was thinking, and where I was going with it. They all have the same face, but every single one of them carries a different story and inspiration. This blog will monitor my progress so that I actually might complete this project. ten by ten by te(nnessee).